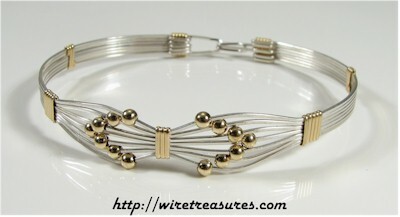 Here's a pretty and bold bangle fashioned from both Sterling Silver and 14K Gold Filled wire. It resembles a bow tie, with fourteen 14K Gold Filled 4mm beads accenting the design. The widest part of this bracelet is 12mm wide, and the band is 5mm wide. You are visitor number 5,087 to this page.